NASA Has A Leaning Launch Tower. Here's What You Need To Know About It. This leaning tower is supposed to test the spacecraft that will bring humans to Mars. 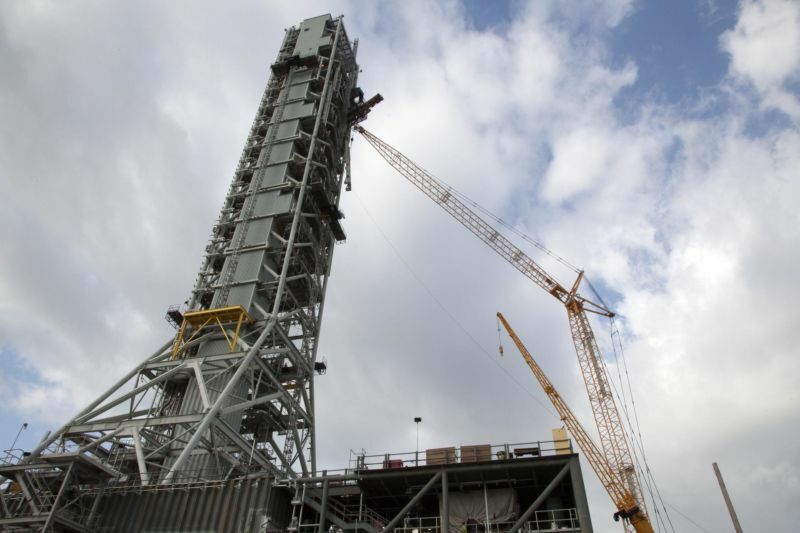 The Mobile Launcher (ML) structure is designed to support testing and servicing of the rocket, as well as move it to the launch pad and aid in the launch itself. It’s not quite bent enough to require an emergency fix, but NASA officials probably won’t beeline for the ML when they show Vice President Mike Pence around the facilities this week. Not only is the tower less than perfectly straight; it also cost nearly $1 billion, and could be used as little as just once. 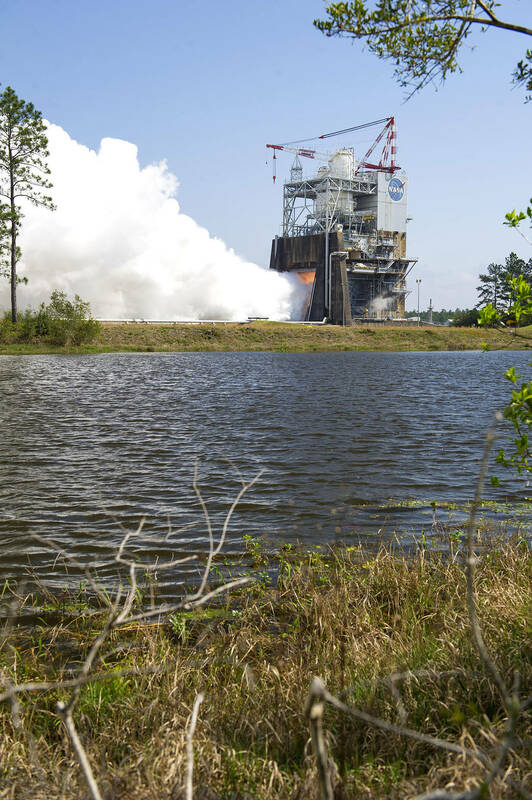 Because of its lean, and the difficulties the agency has had with the tower, it’s possible it will be used for the initial launch of the SLS in 2020 and then discarded. NASA will also potentially scrap the idea of building a second one. As we did, we’re sure you have some questions about the Leaning Tower of NASA. We also have some answers. Q: How did this even happen? A: The construction of this ML began in 2009 for the Ares I rocket. When that project was canceled, and NASA began looking at options to launch the developing SLS rocket, the lowest-cost option appeared to be “simply” modifying this tower. A NASA spokesperson told NASASpaceflight that the lean is probably due to the modifications made to convert it from an Ares I launcher to an SLS launcher. 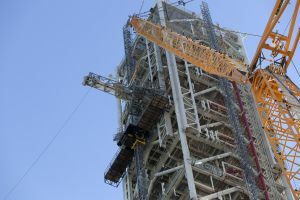 NASA also added that other natural factors could have caused the giant steel structure to move and twist, such as wind, temperature, and vibration as the tower was moved on its crawling transporter. Q: What does this mean for the fate of the ML? NASA says the tower is structurally sound and “does not require a design change or modifications.” Apparently, the lean is well understood, and it has so far matched model predictions. Additional models have predicted how much more the tower might lean as newer parts are installed – and the space agency has a plan in place if that does happen: engineers could remove all of the lightweight fiberglass grating on the tower and replace it with heavier steel grating. However, this change would add another 750,000 pounds to the launcher, taking it a million pounds over its desired weight target — not great for something that will have to be moved around with a heavy rocket on it. NASASpaceflight.com reports that this wouldn’t be an issue for the SLS Block 1 rocket, set to launch in 2020, but could be a problem for the much larger SLS Block 1B. This feeds into the agency’s desire to construct another brand-new, purpose-built launcher. Q: Could this happen again? In 2011, modifying the $234 million launcher was estimated to cost an additional $54 million, which appeared to be the cheapest option. However, things don’t always go according to plan, and NASA ended up spending a total of $912 million on the ML. Furthermore, because NASA intends to improve the SLS’s upper stage to support a larger payload and further range for Block 1B, the ML will require 33 more months of construction and, of course, more money. Instead, building a second ML is estimated to cost $300 million — if this one manages to stay on budget. Yet there’s currently no budget for a secondary launcher, making it unlikely that we’ll see a twin any time soon. If another launcher were to materialize, NASA has received several grim safety lessons in learning from their mistakes; we’d guess the agency will take pains to ensure the next launcher remains on the straight and narrow. Q: Where does this leave NASA in the increasingly crowded world of spaceflight? A: In short, we’ll probably have to wait two years or so to find out the answer to this one. A billion dollars later and with likely only one launch in store, one would hope the SLS better be something special. Still, in the world of reusable rockets that are lowering the cost of space travel, this price tag is a little grim. The SLS is more powerful than the Falcon Heavy while remaining equally capable of ferrying passengers. NASA describes the SLS as having “unprecedented lift capability” and asserts that this, among others, improvement could allow us to venture further into the solar system than ever before. Its payload will be so massive it will even carry an Orion spacecraft, planned to one day take humans to Mars, into low-Earth orbit. However, we all know that NASA isn’t the only organization building a massive spacecraft pointed towards Mars. With multiple entities jockeying to put boots on Mars, let’s just hope NASA’s launcher can lean into the challenge.